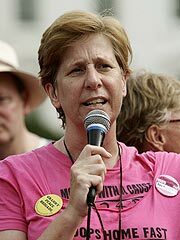 Anti-war activist Cindy Sheehan began a hunger strike on Tuesday – and Susan Sarandon, Sean Penn and other stars are joining her in her "Troops Home Fast" protest. Sheehan, whose son Casey was killed in Iraq in 2004, had her last meal at 12 a.m. on July 4 in front of the White House and will remain on a diet of water, teas and juices until Sept. 1, International Peace Day. "Everything we do is to get the troops to come home," she told PEOPLE outside the White House on Tuesday. "We want to show the world that there are Americans who are committed to peace. Fasting is such a time-honored way of protest."